This month I was a bit scattered with all that is occurring in our world. One of my pieces will reflect the current situation. Also, this is the month of Valentine's Day and I am sharing a piece honoring sweethearts and lovers the world over. I have always loved Valentine's Day and the handmade cards I receive from friends. The adorned chocolate boxes are priceless and although my sweethearts are my friends and chocolates and roses do not come my way, I enjoy walking the aisles of various shops to see what has been created for this special occasion. This particular piece does have a message. Love takes many forms and all of us must respect each individual's choice regardless of our differences. In this particular piece and the first one I use Jonathan Talbot's transfer method which I find to be one of the best. You can Google his name to view not only his work but equipment and tools available to accomplish your own works of art. Each day I am appalled and saddened by Trump, his administration and the Congressmen that support him. I have few ways of expressing my opinionsbut I join artists the world over that are creating pieces in protest. - The George Lucas Museum of Narrative Art is to be constructed in Los Angeles. - Shepard Fairy has now released a new series titled "We the People" in protest of the Trump administration. - Netflix has launched a new documentary series "Abstract: The Art of Design". - The British Royal Mail will be honoring it's first artist, David Bowie, with a postage series. - "Loving Vincent" a partially animated film has been released which examines the life of Vincent Van Gogh and 94 of his paintings. - Did you know that in Las Vegas, Nevada there is a museum featuring old neon signs...visit the Las Vegas Neon Museum if you visit. "Salvaged" showcases the collage and paper works of Kate River at David Anthony Fine Art in Taos, New Mexico through March 31st. "Continuum: Light, Space and Time" continues at the Harwood Museum in Taos, New Mexico through May 21st. - "Time Frozen" is a new exhibit at Vivo Contemporary in Santa Fe, New Mexico through March 14th. - "New Works" featuring Cynthia Cook and Karen Brown are being show through March 31st at Mariposa Gallery in Albuquerque, New Mexico. - "Surreal/Unreal" continues at Jack Rutberg Fine Arts in Los Angeles, California through February 18th. - "Larry Bell" is at the Lisa Smith Wengler Center for the Arts in Malibu, California through April 2nd. - The fabulous work of Greg Miller is featured and the William Turner Gallery in Santa Monica, California through March 4th. - Frida Kahlo's art is now on view at the Dali Museum in St. Peterburg, Florida through April 17th. - Through February 25th Marlborough Fine Arts in London, England exhibits etchings and lithographs of Sigmund Freud and Francis Bacon. - The Festival of Textiles is now on view at the Fashion and Textile Museum in London, England through May 7th. In closing, I wish all of you a deliciously sweet and colorful Valentine's Day. Fill your month with creativity and the joy found there. Because of the political situation in the United States, I feel it is my responsibility to present a blog of activism. Each collage this month represents my reaction to the results of our election in November. As artist's I feel we need to speak up against wrongs in our world and inaction is the same as allowing things to pass us by...we can all give voice! We can all be activists! This was my reaction to the fact the Republican Party selected Donald Trump as their candidate of choice. A result of all the anxiety leading up to election day. "I Can't Believe My Eyes"
Election results left me in shock. As I have a Canadian son, my first reaction was to immigrate back to Canada. "A Gift for Trump: 'Nasty' Women"
Trump called Hillary Clinton a "nasty woman" in one of the debates and started a movement against him. "No, No, No. This Can't Be Happening"
As inauguration day nears and every day presents new Trump messages to limit our rights and eliminate Democracy, I cry out! This month I am keeping the blog short...it New Year's Eve! I will not be presenting Local, National, and International exhibits, but will share some "Must Not Miss". - If the Bauhaus movement was one of your favorites, YouTube has a lovely dance company show at "Das Triadische Ballet"
- Japanese photographer, Shimpei Asai, was given 100 hours with the Beatles in 1966 Tokyo. Tokyo Genesis Publications has now published "Hello, Goodbye: The Beatles in Japan"
- Newspaper sculptures are available for view at: www.strictlypaper.com Plug the name, Chie Hitotsuyama in their search engine and be dazed and amazed. In closing, I wish each and everyone of you a joyful, artfully creative New Year. How many times have you heard "Variety is the spice of life"? This was my 'theme' for my September artwork which is quite varied. There are many artists whose work you can easily identify for the fact that most of the pieces have similar imagery. The artists from my area that come to mind are Erin Currier, Ed Sandoval, R.C. Gorman, etc. In all honesty, I become stale if I stay with one form and, therefore, this month is different from many of my past blogs. I hope you will enjoy the following pieces. Please check out all the happenings across the globe after viewing my latest work. We are a very mobile society...currently I have friends visiting in Germany, Austria, and Italy and one leaves shortly for Switzerland and Spain. For this reason, I share exhibitions to entice those travelers. - The newly opened African America Museum at the Smithsonian in Washington, D.C.
- Meow Wolf's "House of Halloween"opens every Thursday, Friday, Saturday, and Sunday in October from 6 to 9 p.m. It features 3 hours of incredible costumes, dance, music, and performance art. - Through October 16th the San Francisco Center for the Book introduces 20 emerging book artists in "20/20 Vision"
This concludes this month's blog. I wish you a month of 'hallowed events' and creativity. This month I am taking a respite from blogging. Please 'stay tuned' until October and have a very creative month. This month I have been experimenting with Jonathan Talbot's transfer method. I have tried many methods but I find this the easiest and the cleanest method. Last year I took a workshop with Mr. Talbot and learned more about his system. If you have the opportunity to attend one of his workshops you will with come away with a plethora of information and new skills. I recommend checking out his website: www.jonathantalbot.com and considering his method explained in his book "Acrylic Image Transfer". Darlene Olivia McElroy and Sandra Duran Wilson also have a book "Image Transfer Workshop" that has many transfer techniques. You may find it interesting to try all the different methods and determine for your preference. Another goal this month was to use maps. All the backgrounds on the artwork are maps of that particular city. I love maps! A wonderful map artist you may wish to check out can be found at: www.markpowellartist.com His work will 'wow' you! Normally this is not my style but it is always good to experiment. All five pieces completed this were primarily done with transfers. Using gloss gel medium, transfer paper for an inkjet printer (he also has transfer paper for laser printers), release paper and a tacking iron the following pieces were created. "A NEW YORK STATE OF MIND"
- Shelby Pizarro, a fellow subscriber, has an art blog at: sisterhoodofthemuse.blogspot.comShe often explains her techniques and does beautiful work. - Are you on Facebook? Along with Jana Bennett, we have created an art group where you may post your artwork (any genre) and contact info. The name is "Creative Minds - Imagine That!" Just check it out and if you wish to join send a request and wait for approval then post away. - Artist, Taylor Nichczynski, is now doing pet portraiture for the holidays. You may contact her for more information at: tnichczynski@yahoo.com and request images of her work. - Designer, Scott Thrift, has created a clock called "Today" with a singular hand and no numerals. Time is represented in gradient jewel tones for dawn, noon, dusk and midnight. It is available for pre-order at Kickstarter. - Wolfgang Buttress' beehive inspired Expo Pavilion has been transplanted to Kew Gardens in London. - Sound designer, Yuri Suzuki, has a new installation piece using Swarovski crystal bells to orchestrate music....Google it! - Denver Art Museum offers an exhibition "Women of Abstract Impressionism" through September 25th. - "The Presence of Light" a group photography exhibit featuring Robbie Steinbach is on view at Taos Town Hall, Taos, NM through August 5th. - Ronald Davis' "Still Alive" is now on exhibit at Hulse-Warman Gallery, Taos, NM through July 31st. - 203 Fine Art, Taos, NM will feature a group exhibit of many Taos contemporaries from July 8th through August 6th. - "Books, Bosch, and Brilliance" runs July 2nd through 30th at Blue Gaucho in Penasco, NM feaaturing Nancy Lay, Nicki Marx and Lise Poulsen. - Lance Letscher's "Secret File" continues at Tai Modern, Santa Fe, NM through July 2nd. - Nisa Touchon Fine Art, Santa Fe, NM will feature an exhibit with Melinda Tidwell and Zach Collins through July 14th. - "Nature Through Glass", an Australian Glass Show is on view at Tansey Contemporary, Santa Fe, NM through July 25th. - Yes, Cindy Sherman's "Imitation of Life" is still on view at the Broad Museum in Los Angeles through October 2nd. - Seiko Tachibana's "Frames of Reference" is on view at Ruth Bachofner Gallery in Santa Monica, CA through July 23rd. - "New Paintings" by Mitsuko Namiki is now on view through July 30th at the First Independent Gallery, Santa Monica, CA. - Through October 23rd "Japanese Laquerware" is on exhibit at the Asian Art Museum in San Francisco. - Crystal Bridges in Bentonville, AR has an exhibit "American Made: Folk Art Treasures" from July 2nd through September 19th. 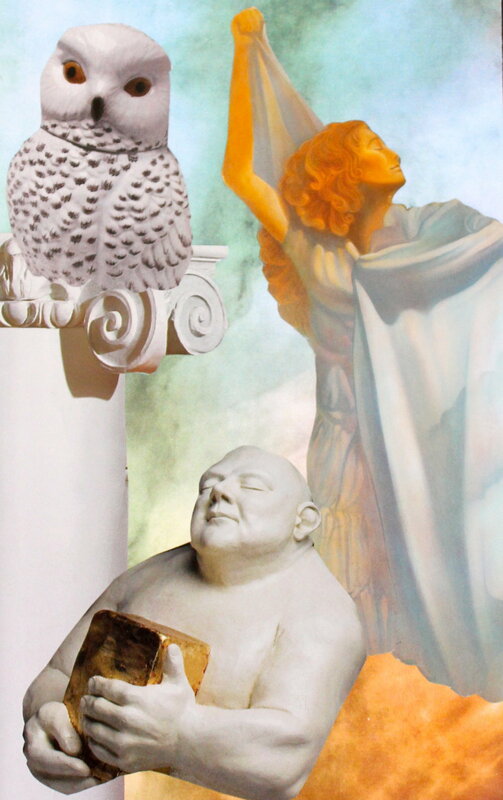 - The Leslie Feely Gallery in New York City continues the Hannelore Baron exhibit through July 16th. - "Stuart Davis: In Full Swing" is on view at the Whitney in New York City through September 25th. - Continuing through July 31st is "A Japanese Constellation" at MOMA, New York City. - Through August 14th at Whitechapel Gallery in London is "Imperfect Chronolgy: Mapping the Contemporary". - "Ai Weiwei 360" continues at the Royal Academy of Arts, London through November 20th. - Continuing through September 15th, "Delacroix as Model" at the Louvre in Paris. - "Kurt Schwitters: Merz" is on exhibit through September 30th at Galerie Gmuizynska in Zurich. Experiment! Trying new methods will bring you not only pleasure (and some frustration at times) and will enhance your work. Whatever your creative genre, do it! Ican also be found on Pinterest and Facebook. Welcome back! This month I will be doing a tribute to the late, great Hannelore Baron whose assemblages and collages have been making quite the smashing hit in the art world lately. First with the Jack Rutberg Fine Art Gallery in Los Angeles and now at the Leslie Feely Gallery in New York City. Before I begin I would like to note that I will be making one slight change at the end of the blog by listing the "Must Not Miss" before exhibitions. She was a Jewish immigrant whose family escaped from Germany following being expelled from their school, their father being beaten with a hammer by the Nazis then placed at Dachau and fleeing by foot to the French border where she and her mother and brother were arrested and sent back. They finally escaped to New York but Hannelore was haunted all her living days with images of her father's beating and the traumatic events that followed. Her work is basically a reaction to the hardships endured as an adolescent and are often dark. She has been singled out as one of the contemporary art's finest in her particular medium and "a spiritual sister to Paul Klee". YouTube has an exceptionally relevant video titled "Hannelore Baron: A Collage and Assemblage Exhibition" produced by Jack Rutberg of Jack Rutberg Fine Arts. Her art is basically recycled or upcycled and I have done my own tribute to her this month with my own recycled/upcycled art. I hope you enjoy! - If you are a book artist or just a lover of book art, check out "360 Mt. Fuji" at: www.thisiscolossal.com They also have a number of flip books available. - Joe Freedman has created the Duograph which is said to create infinite numbers of geometric design. It is a Kickstarter extravaganza! - Debuting in September on PBS is "Make It Artsy" - can't wait! - Chameleon Pens are now available from the U.K. based Chameleon Art Products and said to create over 100 color tones with only 20 markers. They are available at Amazon. - Samurai" continues at the Denver Art Museum through June 5th. - "Mabel Dodge Luhan and Company: American Moderns and the West" is on view at the Harwood Museum in Taos through September 11th. - "Modern Art in Taos: The Second Chapter" will be on view at 203 Fine Arts in Taos through June 30th. - "Small is the New Big" at Nisa Touchon Fine Art in Santa Fe through June 15th. This gallery is renowned for its collage work and an upstairs collage museum. - The Carol Coates exhibit continues at Tansey Contemporary in Santa Fe through June 5th. - Lance Letscher has new works at Tai Modern in Santa Fe from June 3rd through July 2nd. - "Presence/Absence" opens at Vivo Contemporary in Santa Fe from June 1 through August 15th. - The Santa Fe Studio Tour is June 18th and 19th then June 25th and 26th. - "Rust and Clay" New Works by Kelly Whitcomb" available at Mariposa Gallery in Albuquerque from June 3rd through the 30th. - First and foremost, "Unseen Work by Hannelore Baron" at the Leslie Feely Gallery in New York City through July 16th. - Works of Gerhard Richter at Marian Goodman Gallery in New York City through June 25th. - The World Stamp Show - NY 2016 is now happening through June 4th in New York City. - "Edgar Degas: A Strange New Beauty" at MOMA in New York City through July 24th. - "Andy Goldsworthy: Roof" is ongoing at the National Gallery of Art in Washington, D.C.
- "Marc Chagall: Orphee" is also ongoing at the National Gallery of Art in Washington, D.C.
- Works of Agnes Martin are on view at the Los Angeles County Museum of Art through September 11th. - "Cindy Sherman: Imitation of Life" will be on view at the Broad Museum in Los Angeles from June 11th thought October 2nd. - Paper artist, Cara Barer presents "Condrillon" at Bermagot Station Arts Center in Santa Monica, California through July 23rd. - "Alexander Calder: Motion Lab" at MOMA in San Francisco through September 10th. - "Andrea Stanislav: Convergence Infinite" at the St. Louis Art Museum through June 19th. - Three new mirror room installations by Yayoi Kusama will be on view at two galleries in London: the Victoria Miro Gallery and the Victoria Miro Mayfair Gallery from June 3rd through 18th. - "Conceptual Art in Britain: 1964-1979" at Tate Modern, London through August 29th. - "Ai Weiwei 360" remains on view through November 20th at the Royal Academy of Arts, London. - "Exhibitionism: The Rolling Stones" remains on view at the Saatchi Gallery, London through September 4th. - "From Kandinsky to Pollock" will be on view at the Gugenheim in Florence, Italy through July 24th. So much to see and so little time. Stay creative and enjoy life. The lovely month of May has arrived! Flowers are budding or in full bloom and hearsay has it that many of my artistic subscribers are putting their talents to work. Jana Bennett in Missouri is working at establishing a commercial kitchen to create her culinary delights, Linda Taylor in Missouri is taking her art and her jewelry creations to her local farmer's market this June, Cheryl Fosmo of New Mexico has created yet another Garden of Eden, Kai Harper in Penasco is writing a book of her wonderful culinary treats and treating us also with her adventures in life. She is also a wonderful artist. Loretta Nichczynski has her photography and paintings at a local coop and our visitors center. Ah, the wonderful world of creativity. I mention these various aspects of creativity so everyone can find their niche and find fulfillment...we are not limited to painting as an art form. Art has no limits...nor do you! We are born to create!!! Now for my monthly artwork which is followed by exhibitions including local, national and international...and please check out the "Must Not Miss" section for items to inspire. - "Samurai" at the Denver Art Museum through June 5th. - "20 Years/20 Shows" at Site Santa Fe, Santa Fe, New Mexico through May 22nd. - "Giving Voice to Image" at Vivo Contemporary, Santa Fe, New Mexico through May 30th...complete with poetry readings. - "Carol Coates: Solo Exhibition" at Tansey Contemporary, Santa Fe, New Mexico from May 13th through June 5th. - "Freedom in Music Project" at Mariposa Gallery, Albuquerque, New Mexico, May 6th through May 31st. - "Ugly Pie: Works by Gabriel Abeyta" at 555, Taos, New Mexico from May 14th through June 11th. - "Modern Art in Taos: The Second Chapter" at 203 Fine Art, Taos, New Mexico from May 14th through June 30th. - "Mabel Dodge Luhan and Company: American Moderns of the West" at the Harwood Museum of Art, Taos, New Mexico from May 22nd through September 11th. - Lauren Mantecon's "Shape Shifting" at Mark Wooley Gallery, Portland, Oregon through May 15th. - "The Masters of Color: Miro, Matisse, Chagall" at Galerie Michel, Beverly Hills, California through May 14th. - "Picasso" at Heather James Fine Art, Palm Desert, California through May 27th. - " Moses at 90" at Wm. Turner Gallery, Santa Monica, California through June 25th. - Yayoi Kusama's "Infinity Mirror Room", The Broad Museum, Los Angeles, California through Autumn, 2016. (Word of mouth has it that this is an ethereal experience). - "Robert Maplethorpe", Los Angeles County Museum of Art through July 31st and "Agnes Martin" through September 11th. - "Passages in Modern Art: 1946-1996" at the Dallas Museum of Art, Dallas, Texas through May 28, 2017. - Robert Motherwell: The Art of Collage", Paul Kasmen Gallery, New York City through May 21st. - Cornelia Parker has created a replica of Hitchcock's "Psycho" house atop the New York Metropolitan Museum of Art, New York City through October 31st. The house is a 30 foot fabrication. - "Edgar Degas: A Strange New Beauty", MOMA, New York City through July 24th. - "Stumbling Pioneers" featuring the works of Jules de Balincourt, Victoria Miro Gallery, London, England. (Love color? This is your show). - "Exhibitionism: The Rolling Stones", Saatchi Gallery, London, England through September 4th. - "Ai Wei Wei 360" continues at the Royal Academy of the Arts, London, England through November 20th. - "Conceptual Art in Britain: 1964-1979", Tate Modern, London, England through August 29th. - "Delacroix and the Rise of Modern Art", The National Gallery, London, England through May 22nd. - "Delacroix as a Model", Louvre, Paris, France through August 1st. - "Andy Warhol: Shadows", Gugenheim, Bilbao, Spain through October 2nd. - "From Kandinsky to Pollock", Gugenheim, Florence, Italy through July 24th. - Check out Pichi and Avos murals of Greek gods against the chaotic backdrop of graffiti: www.pichiavo.com (They give Banksy a run for the money). - Hot! Hot! Hot! Meow Wolf in Santa Fe, New Mexico...great programs and wild art! - Google Edoardo Tresoldi. He resurrects in wire mesh towering cathedrals and miscellaneous architecture. - Bet you didn't know that Harvard University's Straus Center for Conservation and Technical Studies houses a collection of over 2500 pigments. - Netflix now has an extraordinary documentary about the concert pianist turned piano instructor, Seymour Bernstein. Be sure to watch "Seymour" - it is one of the most profound docs I have seen in many years. - Calvin Nicholls creates with paper at: www.calvinnicholls.comHis constructions are mind-blowing. - Are you an insomniac? Composer, Max Richter has released an eight hour opus "Sleep". It may be worth the try. - Nick Bantock has completed a follow up to the Griffin and Sabine series titled "The Pharo's Gate: The Lost Correspondence of Griffin and Sabine". The story is intoxicating and, as always his artwork almost makes me drunk with pleasure. - YouTube has a 3 part documentary on Jean Michel Basquiat "Basquiat Documental (Documentary)" You must scroll to find the 3 parts as they are not in order. Until next month, I leave you with a quote from Seymour Bernstein. "I never knew with my two hands I could reach the sky." This month as last month, I will delve a bit further into 'inspiration'. Each aspiring artist has their own take on inspiration. Instead of sharing my usual artwork, I am going to present "The Good, The Bad, and the Ugly" - 15 minute collages I have committed to doing every day for a year. Some are good, some are bad, and some are ugly, yes, but doing this keeps the creative juices flowing and the inspiration does come. Before sharing these pieces, I would like to introduce another artist, Noah Scalin, who has published a book "Skull-a-Day". His website is www.SkullADay.com and he has also published other books encouraging others to initiate their own year long project. His project was far more complex than mine and I think you will enjoy his book. Another artist I discovered through my friend, Kathleen, is very inspirational. Her name is Leighanna Light and her website is www.leighannalight.comShe delves in Mixed Media and and Bookarts. I was quite taken by her work. The following collages are a few of my year long project. I used bits and pieces of collected ephemera to create them. I do confess that sometimes they took me longer than 15 minutes but 15 minutes was my goal. If you are lacking inspiration, set a goal and do not concern yourself with the results. The late, great Andy Warhol quoted the following "Don't think about making art, just get it done. Let everyone decide if it's good or bad, whether they love it or hate it. While they are deciding, make even more art." This philosophy is in synch with my own "Just do it!" - "Audacious: Contemporary Artists Speak Out" at the Denver Art Museum, Denver, Colorado through February 26th, 2017. - "Small is the New Big" at the Nisa Touchon Fine Arts Gallery in Santa Fe, New Mexico begins April 15th. Also, check out their Collage Museum. - Tansey Contemporary in Santa Fe, New Mexico presents Lesley Richmonds solo exhibition of exquisite cotton, silk and mixed media creations April 8th - 29th. - Vivo Contemporary in Santa Fe, New Mexico new show "Giving Voice to Image" - a melding of prose, poetry and art begins April 5th - 30th. - Hulse Warman Gallery in Taos, New Mexico features Robbie Steinbach's "Surface Tension" through April 24th. - Taos Shortz Film Festival will be held at the TCA, Taos, New Mexico April 7th - 10th. - "Art Speaks: Taos Pueblo Artists" - 7th annual self-portrait exhibit will be at the Encore Gallery of the TCA in Taos, New Mexico from April 28th through June 5th. - "Charles Berninghaus: Artist, Son, Visionary" runs April 15th through October 9th at the Taos Art Museum in the Fechin House in Taos, New Mexico. - The Salvadore Dali Museum in St. Petersburg, Florida continues "Disney and Dali: Architects of the Future" through June 12th. - New York's MOMA continues "Jackson Pollock: A Collection Survey, 1934-1954" through May 1st. Also, "Edgar Degas: A Strange New Beauty" continues through July 24th. - The Museum of Fine Arts in Boston continues "Visiting Masterpieces: Pairing Picasso" through June 26th. - The Heard Museum, Phoenix, Arizona continues "Stradivarius: Origins and Legacy of the Greatest Violin Maker" through June 5th. - The Broad Museum in Los Angeles continues Yayoi Kusama's "Infinity Mirror Room" throughSeptember 20th. - Jack Rutberg Fine Arts in Los Angeles continues "Modern and Contemporary Work" through April 30th. - Muriel Guepin Gallery in New York City features the work of Susanna Bauer through April 16th. - The Asian Art Museum in San Francisco feature the meticulous bamboo weavings of Fujitsuka Shosei from April 5th through 10th. - The Royal Academy of Arts in London, England continues "Painting the Modern Garden: Monet to Matisse" through April 20th and "Ai Weiwei 360" through November 20th. - The Saatchi Gallery, London, England presents "Exhibitionism: The Rolling Stones" from April 4th through September 4th featuring works by Warhol, Shepard Fairey, Alexander McQueen and more. - London's Newport Street Gallery presents Jeff Koon's solo exhibit "Now" from May 18th through October 16th. - The National Gallery, London, presents "Delacroix and the Rise of Modern Art" through May 22nd. - Galerie Kronsbein, Munich, Germany presents Banksy's first solo show in that country from April 14th through September 10th. - Check out the art of Mark Powell at www.saatchiart.comMark uses vintage envelopes and maps to create these intriguing works of art. - "Mapplethorpe: Look at the Pictures" premieres April 4th on HBO. - Wow, wow, wow! Iris Scott fingerpaints beautiful art...www.irisscottfineart.comYou won't believe it. - Available on Netflix "Raiders of the Lost Art" - uniquely informative. - Nick Bantock's final volume in the Griffin and Sabine series "The Pharo's Gate" has now published. Mine is on order!!! - Sotheby's Institute of Art offers online courses placing the art world at your fingertips. I leave you with one more quote: "Every day of that year, I had to have a new experience, find something new in my environment, create something unique, and thus I lived much more engaged in the present than I ever had before." September was a fantastic month. The highlight for me was taking a workshop from Jonathan Talbot, a collage artist from Warwick, New York. I had followed his work and techniques for many years and, alas, he was in Santa Fe. It was everything I had hoped a workshop would be. My issue in past workshops is to 'freeze' when the goal is to create a piece. Mr. Talbot did not concentrate on creating but on techniques and process. I learned so much. This blog will share some of the photos I took at the workshop. Northern New Mexico is full to overflowing in the autumn with art events. Taos had its second year of The Paseo....art installations from all over the States. One piece in particular that stands out was from Burning Man. The Taos Fall Arts Festival was phenomenal. The Invite was the most innovative that I can remember. In my own art I decided to take a different route on several pieces and will share them with you now. Now for my usual genre. "Missing You" was inspired by an uncle who served in the Navy for many years and was well loved by his family...in my imagination he & his immediate family shared many letters, telegrams and photos when he was sailing far away. "Days of Yore" was inspired by my childhood. Our house was filled with music and dance...my Mom could jitterbug up a storm and my Uncle Sam and Aunt Francis would often dance to entertain us. Now for the workshop! At the very end of our two days I started a piece, but, as usual, froze and did not finish. When I got home and digested all I had learned I headed for my studio, put on Abba's Greatest Hits and voila..."Listening to Abba" is the result. It would be an interesting study in art to listen to various genres of music and create while listening...I cannot imagine what Heavy Metal would result in!!!!! I have included a few photos from the workshop which was held at the Nisa Touchon Fine Art Gallery on Rosina Street in Santa Fe. It specializes in collage and mixed media. Upstairs is The Museum of Collage...a must! Jonathan with some workshop attendees. Ruth came all the way from Texas for the workshop. Lisa drove down from Taos with me for the workshop. My friend, Linda, is the first on the right. She also came down from Taos and tried, tried, tried avoiding me and the camera! - October 3rd and 4th is the El Rito Studio Tour...my all time favorite is the Vanderbrooks. Pottery, painting, photography, collage and mixed media are their mediums and all done well. - October 3rd and 4th is the Wool Festival in Kit Carson Park, Taos, New Mexico. - October 3rd through 11th is the Albuquerque International Balloon Festival. - October 23rd through 25th is the Taos Mountain Balloon Rally. - October 6th through 29th the Stables Gallery in Taos presents "Pressing on 5" - 17 contemporary printmakers are featured. - Through January 17, 2016 the New Mexico Museum of Art in Santa Fe presents "O'Keeffe in Process". - Through February 7th, 2016 MOMA in New York City features Picasso Sculpture - over 100 pieces of sculpture "complimented by selected works on paper and photographs." - Through October 19th, "Jeff Koons: A Retrospective" continues at the Whitney in New York City"
- Through October 19th, "Joseph Cornell's Wanderlust" continues at the Royal Academy of the Arts in London, England. - Ai Weiwei is also at the Royal Academy of the Arts, London through December 13th. - The Royal Academy of the Arts is on the move with an exhibit of the ceramics of Edmund de Waal. If you are a movie or book buff you will recall his "Woman in Gold". - Through October 11th Agnes Martin's "Retrospective" will be on view at the Tate in London. - The Nisa Touchon Fine Art Gallery in Santa Fe. Open approximately 5 months. 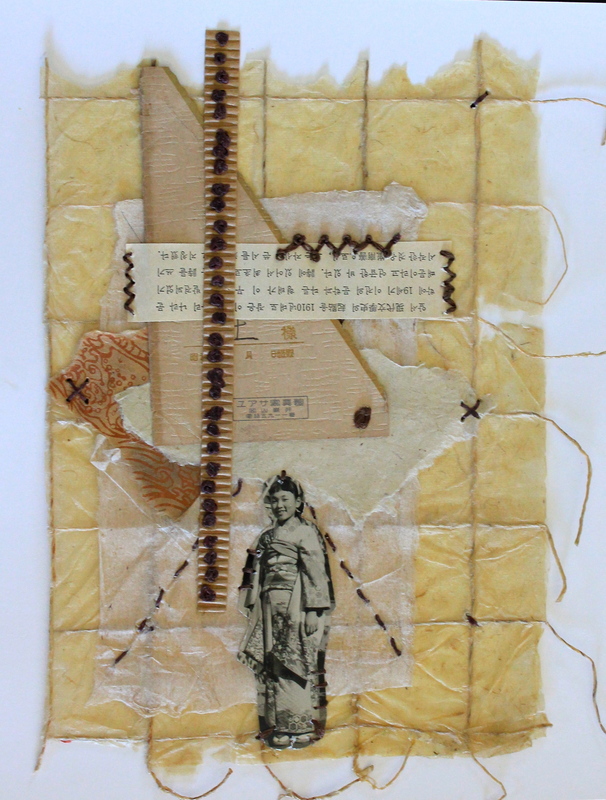 The gallery specializes in collage and mixed media. The upstairs is devoted to the Museum of Collage. It is well worth a trip to Santa Fe just to take in this gallery. - The Broad Museum in Los Angeles has just opened on September 20th. This is a most unique museum for the fact that there are no entrance fees. Edythe and Eli Broad showcase over 2000 pieces of contemporary art (their own collection). Artists include, Cindy Sherman, Andy Warhol, Basquiat, Chuck Close and many, many more. - The 2016 Pirelli calendar is out! In the past it has been quite racy. This year it features 12 provocative photos by Annie Liebovitz which include Patti Smith, Yoko Ono, and Tavi Gevinson. - "Living in a Fairytale World" by Mr. Finch is a book for all fabric artists out there. He uses leather, old tapestries, roadside finds to create butterflies, birds, bulbs, bunnies, spiders, moths, mice and much more. Wow! Happy Autumn! See you next month. August has come and gone. September rushes us towards autumn and a quieter time...a time for creativity. In August I attended the "Killer Heels: The Art of the High-heeled Shoe" at the Museum of Albuquerque. It was absolutely fascinating. What torture women put themselves through for the sake of fashion. I no longer wear those "fashionable" shoes but still appreciate their whimsy and aesthetics. As a result of this exhibit, I did two pieces using some Polaroid transfers I did of an art shoe exhibit in 2002 at ArtFest in Port Townsend, Washington. I will explain the process later but first another piece I completed in August. Now are you ready for a "really big shoe?" Now are you ready for my pieces? They are totally whimsical and I had fun doing them. I took slides then transferred them onto Polaroid film. Then the images were rolled out onto watercolor paper and I enhanced the color with colored pencils. - Through September 10th, Zachariah Rieke's exhibit of new paintings continues at the Wade Wilson gallery in Santa Fe, New Mexico. - Through September 12th, the Artes des Cartes show of recyled art is on view at the Stables Gallery in Taos, New Mexico. - September 5, 6, and 7is the Open Studio Tour for member of TAO in Taos, New Mexico. - September 5th and 6th is the Pilar, New Mexico Studio Tour. - September 12th and 13th is the Rio Costilla, New Mexico Studio Tour. - September 12th and 13th is the Alameda, New Mexico Tour. - September 11th, 12th and 13th is the Las Vegas New Mexico Studio Tour. - September 12th and 13th is the Sandia Heights Open Studio in Albuquerque, New Mexico. - September 19th and 20th is the Poqoaque River Art Tour in New Mexico. - September 19th and 20th is the Pecos Studio Tour in New Mexico. - September 19th, 20th, 26th and 27th is the High Road Art Tour in New Mexico. - October 3rd and 4th is the El Rito, New Mexico Art Tour. - Yoko Ono's One Woman Show continues through September 7th at Moma in New York City. - Jeff Koons: A Retrospective continues at the Whitney in New York City through October 19th. - Joseph Cornell's "Wanderlust exhibit continues through October 19th at the Royal Academy of the Arts in London, England. - Warhol's Nature exhibit continues at the Crystal Bridges Museum in Arkansas. Get the latest blog posts sent right to your inbox!